Support To Win or STW. That’s a project that USA pro team and Megabass have been working on together to pursue the word “victory”. The battle field is the world’s best bass fishing tournament “Bassmaster classic”. In 2016…Edwin Evers finally won the first place at the Bassmaster classic. Let’s review the memorable victory that is a big step for not only Edwin but Mebagass as well. Bassmaster classic is the world’s best sports fishing tournament, nothing like any other ordinary fishing competitions. The competitors chosen from all over the world are rather top athletes than just anglers, they are risk takers who put everything into this competition. It was 2013 when Megabass started to launch this grand project towards this big event. We launched new corporate in US as a prologue and establish TEAM MEGABASS at the same time, followed by the Japanese development team that flew to the US. We confirmed “serious determination to win the Bassmaster classic”, after a number of meetings to understand each other, even though we had a wall of language and cultural differences. In 2014, we joined the classic with a lure, code name: MSC01 (later S-CRANK) and did great during practice till right before the final day when the condition drastically changed. We got so much out of the tournament even though we didn’t get first place, and the highest was Edwin Evers who got third place. 2 years after that day, Megabass finally won victory in 2016 Bassmaster classic that was held in Grand lake, Oklahoma during 03/04-03/06. The person who received the honor was Edwin Evers who had mortifying experience 2 years ago by Aaron Martens who had taken the place of the champ, he was once the same Megabass teammate in the Elite series. The wining lure was his favorite, FLAP SLAP. Winning by catching fish over 29lb on the last day of the competition was a spectacular achievement that we can call sweet revenge to pay back that mortifying day. FLAP SLAP helped him again to bring him the best honor, first place this time, which helped him at the former classic. What a dramatic victory. The top pro entrusted one lure to fight through tough tournament with all his knowledge and technics. It didn’t happen if he didn’t have 100% trust in the lure. Gaining US top pro’s trust through STW project means much more than just victory to Megabass, I would say. He fell in love with Megabass lure (not just business like) and kept using it, he returned the best result “victory” back to us. However, Megabass is not just satisfied yet. This victory is just a new prologue to further battle fields. Because Megabass is a challenger who never stops challenging ourselves to get better. The new project has already begun for next victory. 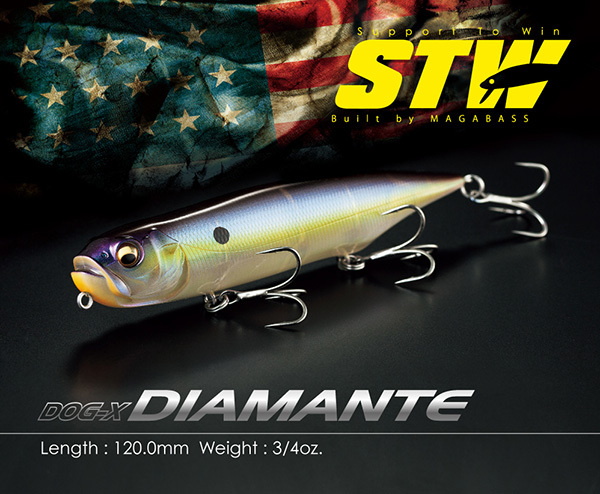 S-CRANK which is remodel version of MSC01 produced by STW was released and a pencil bait, DOG-X DIAMANTE made a debut to win this year. It’s not too far until people start to talk about the achievements of STW and these lures again. FLAP SLAP, the lure that brought Edwin the victory this time… What kind of lure FLAP SLAP is? 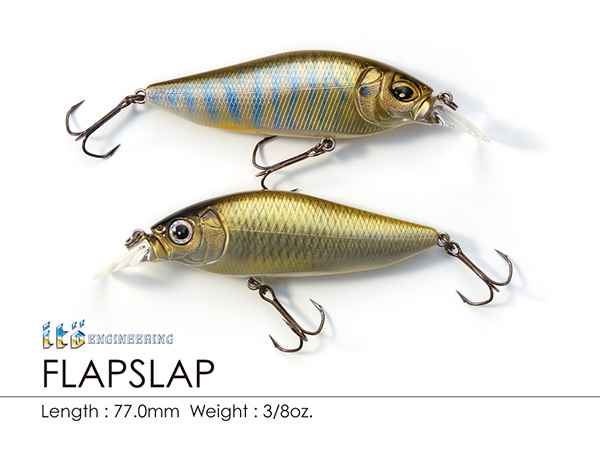 FLAP SLAP was produced by ITO engineering which places top rank in Megabass brand, when I talk about its character in brief, “Realistic flat sided crank that is characteristic of intense flashing effect caused by tight high pitch rolling” the designer Yuki Ito himself talked about the example to use this lure. “There is this commonly accepted theory that flat sided crank (like FLAP SLAP) is good to use in spring. But it is not simply because of strong flashing and a strong push through water. The more important thing is “clearly yet irregularly flashing” unlikely fat type of lure moves water dynamically; therefore, the shape is inevitable. That’s why I don’t use much if the lure doesn’t have irregular pendulum action, even if it’s flat sided. 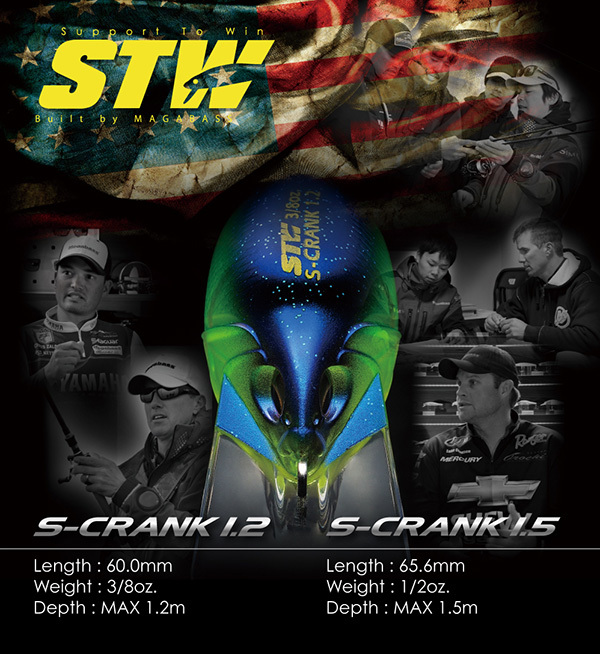 The best flat sided crank would be able to act as a shad that has tight motions and tilts its body into sharp angles in high speed with pendulum action responding to any sudden change of retrieve. The basic use of FLAP SLAP is “slow retrieve with a moment of pausing”. Originally, FLAP SLAP was developed under the concept to create super high pitch rolling even though it’s flat sided, our original crank shaft balancer made it happen. Furthermore, the biggest special feature of this lure is “the ability of attracting fish by creating irregular flashing without bumping into anything.” Therefore, the slow retrieve should be the standard for this lure which is the limit for the lure to be able to still perform properly….and add a moment of still time to create the change and the bite chance. Megabass technology supports top athletes’ tactics and embodies them into better shapes. Not only STW project, it’s more like “All Megabass” project using the ground breaking theories of I.T.O. engineering. That accelerates the common vector which is “Serious fight in bassmaster classic, and win!”, and take it to the next level. This time, Edwin snatched the victory in his hand having literally all Megabass on his back. The strong passion is and will always be our driving force towards the great victory!